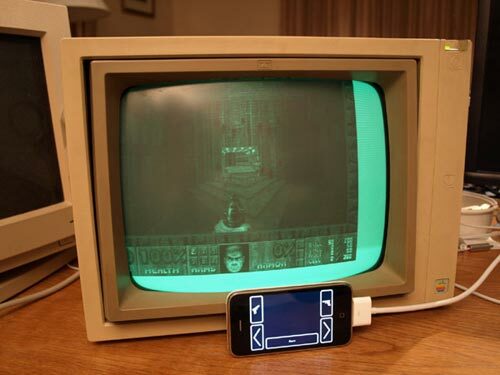 Steven Troughton-Smith who brought Doom to the iPhone has updated it, and it now works with TV out. After Steven read that Ars Technica had discovered that the iPhone has TV Out since the latest SDK update, he decided to update his App. I had been watching Erica Sadun’s awesome TV-Out work on the iPhone with great interest, and in my testing I decided I should have some fun. So, without further ado, here’s Doom running with TV-Out enabled on an authentic monochrome Apple II monitor (yes, this is what passes for ‘fun’ around me). Head on over to Steven’s site for more details.